I was doing one of those random Google searches the other day, you know the kind, when you find yourself wondering what happened to the girl you lost your virginity to, or some kid you did awful things with after Sunday School, those moments when you feel, well, curious about stuff. I mean that’s what the internet is for right? Anyway, a few weeks ago now I typed the name David Ditchfield into my search engine as I was having some of those aforesaid whatever happened to thoughts and hey presto. I hadn’t really expected anything as most of these vanity searches seem futile [probably because the girl I lost my virginity to has changed her sir name ha ha, but I digress…] this time, unlike Bono, I found what I was looking for. All this retro spectating brings me on to David’s new project which is best summarised in the following press release, I’ve had a listen to bits of it, and it’s a truly imaginative modern classical work, one that has been cathartic in David’s own personal regeneration, which I know sounds a tad dramatic but it’s quite a story it really is. Here’s the press release… + link to David’s myspace, do investigate do. A ‘near-death experience’ has inspired a Cambridgeshire musician who’s opened tours for the Beach Boys and Fine Young Cannibals to compose a symphony, which he says has been instrumental in helping him to recover mentally and physically from a horrific train accident two years ago. 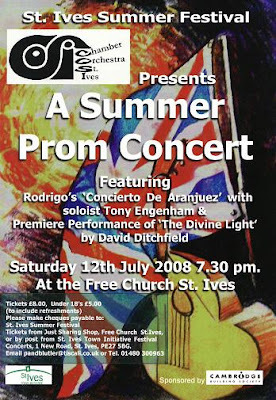 “The Divine Light”, written by David Ditchfield will be premiered this summer on 12th July 2008 by The Chamber Orchestra of St Ives, at The Free Church in the 16th Century town of St Ives, Cambridgeshire. According to its composer it is a very personal piece that reflects his ‘mystical’, ‘spiritual’ and finally ‘euphoric’ journey through his ‘near-death experience’. David’s move into classical music is a departure from his pop roots and the symphony is his first major project since the accident. In the past he has co-written songs for influential artists such Dexy’s Midnight Runners and been signed to several major music companies. Although his injuries from his accident have left him unable to play the guitar, his love of music and performance has not diminished. “After David’s accident in 2006, the community of musicians in St Ives were shocked by the extent of his injuries and the implications they would have on his career. He is however a very positive person and channelled his spiritual and creative energies into his music. “Julian Merson, renowned baritone soloist, will be performing a moving solo piece written by David and personally, I think the lyrics are poignant. 1 Two years ago David Ditchfield had a serious accident when his coat became trapped in the doors of a departing train at Huntingdon station. He was pulled onto the railway track and under the wheels of the train. Paramedics saved his life at the scene and he was also resuscitated later at Addenbrooke’s hospital. The accident was reported widely in the national and regional media. 2 He sustained severe injuries to his left arm and lost the little finger to his left hand. He underwent 3 major operations in order to save his arm and is still recovering his injuries.